Advice Straight From a Publisher on Getting Your Book Published. How do you get the attention of a publisher or agent? It's a question many writers ask themselves on a daily basis. Until I started working in the industry myself, I asked the same question. As a small press interested in furthering the careers of writers, both those we publish and those we don't, I'm happy to offer a few small tips on getting your manuscript noticed. First of all, the biggest lesson you need to take from this is to read the guidelines. Only submit what the agents or publishers are looking for. Don't assume just because your book is super amazing that you don't have to follow the rules. It's disrespectful and makes you look bad right from the start. And if you start out your query letter with, "I know you've specifically said no vampire erotica, but I think my novel is different than all the others," just know, your manuscript will likely never get read. Why waste the time then? Look for those who are looking for what you've written, it saves a lot of time and hassle for you, and it's less likely that you'll annoy someone who you may want to submit to again in the future. If there's no one out there willing to publish your unique idea? Well self-publishing may be the best option for you. So Rule Number One is READ THE GUIDELINES. They aren't suggestions, they're the basic requirements to even get your manuscript looked at. Use them and you're one step ahead of a lot of folks who think the rules don't apply to them. Rule Number Two is to not be a jerk. Sure, it may sound obvious, but you might be surprised how many people submit their work, assuming that the agent/publisher has nothing else to do than cater to their whims. Regardless of how great your work is, if you come off as pretentious jerk, the chances of someone signing you is slim to none. The publishing industry is brutal, and it often takes awhile for the agents/publishers to read your work. If it's a smaller house, it might take even longer. Be respectful, don't harass them and look to the guidelines to see if they mention following up. If they don't, give it at least six weeks before you send a follow-up, and then simply ask if they got the manuscript. Be polite. Also, don't ever say you're the best writer ever, or even that you're better than most writers out there. This may sound obvious, but it does happen more often than I'd care to admit. It sounds conceited, and well, when it comes to working with you, there will be edits... And if you already think you're the best writer there is, it may seem like you're not willing to take feedback or to grow, which is a red flag right from the start. Sure, maybe your piece will wow them, but if you come off sounding like you're going to difficult to work with, you may get a pass from the very start. Be confident, but don't diss others in your pursuit. It isn't classy. Rule Number Three may sound counterintuitive to what I wrote above, but it isn't. Be confident in your work. In your query letter, explain all the different ways you're working to make your book a success. Marketing is often split between the publisher and the author, and sometimes the author has to do the bulk of it. If you're not proud enough of your work to tell your friends about it, or create a website to write about it, how do you expect anyone else to take pride in it? It isn't about spamming people with "Buy my book" as that never works. It's about talking about it, reaching for the stars and making plans for success, either with or without that publisher signing you. If you base your entire success on whether or not they sign you, well, what's that say about your book? Charlotte Pickering is an example of someone who has the drive and confidence to succeed. The reason her manuscript, Messiah of the Slums, initially caught my attention is because she not only followed the guidelines and knew what I was looking to publish, she also made huge plans for the release of her book that included films, getting reviews from important figures, etc. And guess what? It's working. Because she had the confidence to approach people others would consider out of their league, she's getting feedback from very important people. All because she knows she has something special, and through her query letter alone, she convinced me that it was something special too. Of course, there are no guarantees in this industry. You can follow all the rules, do everything right, and still not get the attention of those in control. It's a brutal industry, and there will be more rejections than acceptances, that's a given. Even J.K. Rowling has been denied countless times. But she kept fighting, and as we all know, it only takes one "Yes" to change your world. Improve your craft by developing a thick skin, learning to take feedback and continuing to grow as a writer. When you look at the success stories, it may seem like they happened overnight. But most have written countless books you probably will never read because they were never signed. Others have spent decades trying to break into the industry. It's those who don't give up, who can handle the criticism that comes along with putting yourself out in the public eye, that have the greatest chance of success. So if you want this, don't give up. Keep writing, accept critique, and keep submitting those novels. You can only get better with practice. More tips and advice will be coming in the future, along with other blog posts. I'd love to hear about your experiences, what frustrates you the most about being a writer. If you have any questions for me, I'm happy to answer them. Sure, it might take awhile because I'm super busy running a company plus working on other projects, but who knows? Maybe I can address your question or concern in a future blog post. So go forth, ask away, and hopefully I can help you on your journey to success. If all continues to go as planned, Heartbeats: Voices Against Oppression will be released at the end of May. Heartbeats is a unique collaboration between author M. Kate Allen, Solarwyrm Press, and Fey Publishing. But we couldn't have done this without an incredible artist named Luke Spooner who donated his time to create an amazing cover. All the parties involved are working on this anthology for free. Jax Goss, co-owner of Solarwyrm, is doing the editing, and Fey Publishing is formatting the book for print and publishing it. The intro and the idea are all the work of M. Kate Allen. All proceeds raised from the sale of this book will be donated to notforsalecampaign.com. The writers featured in this anthology have also donated their work to the anthology. Jax Goss has said, "The stories in the book are stories of oppression and liberation, of empowerment and the stripping away of power, of enslavement and escape. Many are hard to read, many will break your hearts or make them soar, all are united in the idea that the use and abuse of humans must stop." Everything has come together really quickly for this, but it's because the three of us were passionate about the cause and wanted to do something to help end the enslavement of men, women, and children around the world. And of course, a book wouldn't be complete without a cover. Thanks again to Luke Spooner for the fantastic work he's done in such a short amount of time. Fey Publishing is excited to announce the release of Messiah of the Slums by Charlotte Pickering on April 16th. More details and photos will come in the next week or so, but for now, we are setting up a blog tour after the release of the book and we'd like to include your blog! This book has already gotten media attention, and there are two short films that will be released at the same time. If you'd like to be part of the ginormous release, please contact Fey Publishing via their Facebook page. ARC copies may be provided to those interested in reviewing as part of the blog tour. There will be a giveaway and your social media links will be included in there to encourage people to check out your pages for entries into the giveaway. Also, your blog post will be shared via social media to draw traffic to your site as well. ETA: For those interested in reviewing the book for your blog, as well as on Amazon and Goodreads, please contact Fey Publishing by sending them a message on their Facebook page. Thanks! Shriveton, a 21st century sink estate on the outskirts of Liverpool, is controlled by the Incubo, a global drug lord. Corrupt law enforcement, endemic unemployment and social fragmentation have made it a fertile land for unfettered criminality. For decades, the Shriveton people have put up, and shut up, because to challenge the status quo is fatal. The Incubo is the only employer in the area, and the only way out for his soldiers, mostly recruited as primary-school boys, is death. But rumours have sprung up about a mysterious and always solitary, young Muslim woman. She is defiant in the face of the evil all around, and seen variously as a friend of the friendless, healer of the sick, priestess, saint, lover, saviour and god incarnate. The revolution she sparks is characterised by savagery, bewilderment and outrageous acts of mercy. Told through the eyes of Shriveton’s radicals, dealers, prostitutes, users and kingpins, Messiah of the Slums is her story. 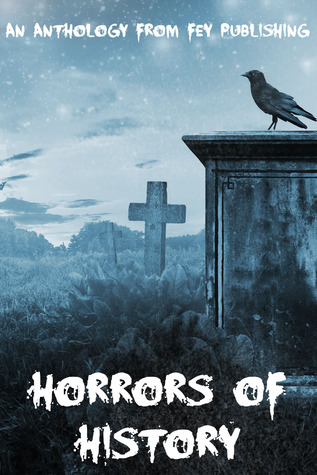 Horrors of History Release and Halloween Giveaway! To celebrate Halloween and the release Horrors of History, we are giving away paperback copies of the book to two lucky readers! Have you ever wondered what really happened in Roanoke or whether Vlad the Impaler was actually a vampire? Within these pages, you will discover a world where mermaids meet up with Jack the Ripper and the undead fight in the Civil War. You'll explore history from horrific medieval diseases to present day disasters. This is the history of the world like you’ve never seen it before. Paperback is coming soon to Amazon, but you can buy the book directly from the publisher here. The book is also available for the Kindle, other formats coming soon. Or win a copy in our Goodreads giveaway! Bayou L'Abeille by A.D Sams. If you're looking for an escape from it all, come on down to Bayou L'Abeille for a visit. Take a stroll through the L'Abeille-Toombs Historical Cemetery or our prize gardens kept by Miss Nonie. Hear the colorful stories from our favorite musicians at Popeye Sims' Music Shop and you might even run into local legend Lenny Waxman. Have breakfast at The Butter Biscuit then enjoy some junktique shopping and coffee at the Joe-N-Junk. Grab a po' boy for lunch at the L'Abeille Diner, but make sure to save some room for BBQ and blues over at Cottonmouth's Review. If you mention Honey Slade, Cottonmouth will fix you up with a free plate of beignets. Don't be put off by the Alligator Advisory, in effect until the end of the season for the south side bayou near Roux Roux St. A white alligator has been spotted in the water, proving that even our 'gators are special. The people of Bayou L'Abeille walk a fine rhythm between lovely and heartbreaking, hilarious and sad, bitter and so very, very sweet. Why not join them and experience a slice of life on the bayou? Available on Amazon and Barnes and Noble. Only $2.99 for the Kindle! I'm sure I'll be losing my mind soon. If you see it running down the street, will you set out a saucer of wine and some candy for it? Thanks. Shall I introduce myself? Just along the border of Louisiana in the flat lands of Texas, The Devil's Pocket abides. This is where I was born. The Pocket, as locals call it, is so small that the 200 residents decided that since I was the most rotund baby born in a century, my family and I were loaded into the town cannon and shot all the way to Georgia. Trust me; it’s a true story. Despite our exodus, life from the The Pocket lingers within. I laugh just like my grandmother. I make a fantastic étouffée. I dream of moss swinging from the trees in the sunlight. I still love the smell after a rain and I miss the season of love bugs. Now, I'm in my mid-30's. I live in West Georgia with a gaggle of furry creatures and a very healthy Imagination. I keep it in an igloo in the back yard. Follow A.D. Sams on Facebook and add Bayou L'Abeille to your Goodreads lists! Follow Fey Publishing on Facebook and Twitter!